Possible spinal stenosis fibromyalgia links exist throughout modern medical literature. There is some research which shows possible connections between the cause of FMS and a source stenotic process in the spine. However, much of the information is anecdotal and is far from being accepted as fact within the mainstream medical community. This essay will detail the possibility that FMS may be related to stenotic changes in some circumstances, citing patient experiences, as well as professional medical opinions and research. FMS is a mysterious musculoskeletal ailment which has no definitive cause and no universal treatment. In fact, fibromyalgia suffers from some of the worst diagnostic and treatment diversity in the medical sector. Basically, doctors can not agree on what exactly causes FMS, so they really have no sure way of effectively dealing with it. It is no surprise that many patients with FMS also have spinal stenosis. Remember, stenotic changes are normal in the human spine, particularly after middle age. FMS is a disease which affects predominately younger women, but many middle age and elderly women have also been diagnosed, as well as a relatively small number of men. Could the stenosis reported by patients and doctors factor into who might get FMS? Is there any clear cut evidence of a connection? Let’s look deeper. FMS has been linked to many possible causative processes, circumstances and substances. Among the great diversity of culprit factors cited as potentially causing or contributing to fibromyalgia, nerve problems are some of the most universally embraced theories. Since spinal stenosis can affect the entire spinal cord, especially when the canal narrowing exists in the neck or upper back, the effects can surely seem systemic in some patients. This might help to explain the illogically large pattern of pain and nerve symptoms suffered by many FMS patients. Of course, there are far more people who have spinal stenosis than those who develop FMS. What might make some people more susceptible than others, given the same degree of stenotic change? This, and other pertinent questions, still have not been definitively answered by doctors who embrace a potential link between stenosis and FMS. We wish that we had a more defined answer for patients who are curious about the relationship between FMS and spinal canal narrowing. Unfortunately, when it comes to FMS, we are all in the dark, with many doctors not even believing the condition exists at all. This is not to say that they doubt the terrible pain suffered by patients. It simply means that many medical professionals see other causative processes as being the true source, and FMS simply being an invented nomenclature which mistakenly encompasses many other pain disorders and absorbs mistaken diagnostic conclusions. Spinal stenosis can produce very different symptoms from patient to patient. We certainly could see how a person with severe stenosis might be diagnosed with FMS incorrectly and we can also understand how FMS sufferers with stenosis might find links in their own belief systems. For more information on FMS, we recommend reading the fibromyalgia relief section on the original Cure-Back-Pain.Org website. Many mindbody professionals have speculated that FMS is a disease of the mind and not just of the body. In response, we have explored this possibility in great detail and hope to enlighten patients to all potential causes of their pain. 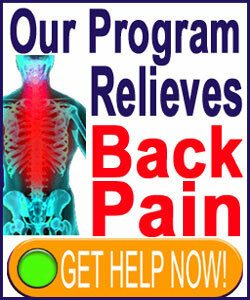 In fact, we cover fibromyalgia in vivid detail in our own best selling book, Cure Back Pain Forever.